What did Jiraiya write on Fukasaku's back? How can we decode this? Answering this question would spoil a key turning point in the anime for you, it makes more sense and would be way more thrilling if you watched the episodes of that arc all the way through. But if you really, REALLY want to spoil it. Hover the spoil tag below.... You have been warned! 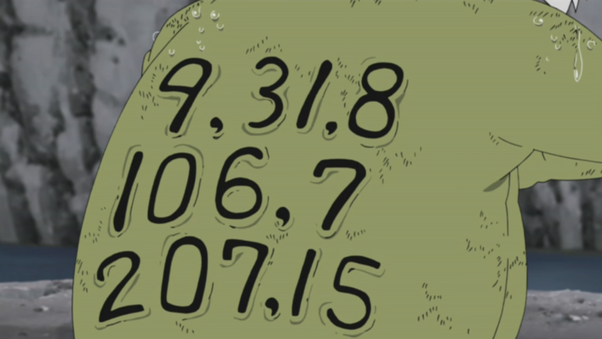 The numbers are a code, a code meant only for Naruto to decipher as he is the person closest to him. It's a cipher based off of his book series that he's been working on that gives some critical insight on how Pain works. In his last dying moments he fought like a true shinobi and ensured his enemies demise. The full message reads "The real one's not among them". And to resolve this conflict Naruto must train under the Toads and master sage mode. The code left by Jiraya was meant to be a hint from one of his books and the very first letters of their page numbers. Well the no. 9 isn't actually a no. It's a letter from the Japanese language 'Katakana' that reads as "ta". By which he meant his book's name 'make out tactics '. By 31,8 , Jiraya meant 8th word of 31 page no. By 106,7 , he meant 7th word of 107 page no. By 207,15 , he meant 15th word of 207 page no. And all these words read: " THE - REAL- ONE'S -NOT -AMONG-THEM". How can the man in the back see? Why didn't Jiraiya use reverse summoning as a way to escape? Can Sasuke use his Rinnegan to bring Jiraiya and Itachi back to life?